Nikon is a global leader in precision optics. It has created a range of binoculars for virtually any application, making it easy to find impeccable optics whatever your passion. 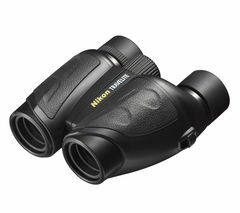 For sport, birdwatching, travel or a night at the opera, Nikon binoculars are the perfect option for your needs and budget. 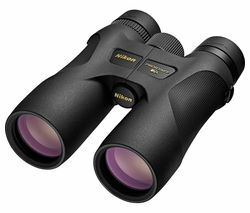 All Nikon binoculars feature Nikon multilayer-coated lenses of the highest quality. The result is astonishingly bright, reliably razor-sharp images. All models are ruggedly constructed, with finely tuned ergonomic engineering for comfortable handling no matter how long they’re in use. Every pair of Nikon binoculars also comes with a 10-year guarantee for total peace of mind. The Nikon range includes several key families, including the robust Monarch, professional PROSTAFF, ultra portable Travelite and popular Aculon. Choose from optics that deliver 8x to 24x magnification to give you the best possible view in any setting. You can also choose between traditional porro prism and roof prism binocular designs. Nikon’s Aculon range offers a more personalised selection of optics. With a sporty design, they come in a wide range of colour options and finishes to suit you. From sleek metallics to bold yellows and pinks, whatever the occasion these binoculars will complement your own personal style. They’re also compact a versatile, with foldable and non-foldable options, offering 8x to 24x magnification and 21mm to 50mm optical lenses. Nikon’s Monarch and PROSTAFF ranges take things up a notch with more rugged design, waterproof body and fogproof lenses. Made for intense use even under difficult light conditions, the Monarch range delivers the sharp, bright images and rough design that serious hunters and nature watchers need. The latest PROSTAFF 7S is made for bird watching and wildlife observation and for that reason, viewing comfort is key. Details like the knurling on the focusing ring make adjusting the binocular easy and natural, while long eye relief design ensures a clear field of view, even for eyeglass wearers. For more binocular options for a range of sports and activities take a look at our Bushnell binoculars and view all Celestron binoculars.